I am SO happy fall is officially here!! The weather here was pretty rainy and chilly all weekend, so we stayed in and I made some yummy recipes including the best chili I’ve ever made (you can find the recipe on my Pinterest!). One of my favorite things about fall being able to layer. This Madewell cardigan from Nordstrom is SO soft and cozy and I love that it’s a neutral color, making it a staple piece I can wear all season long. Thank you very much Daniela! Love your outfit, so cool with neutrals. I have that bag on my wish list, but I prefer the glossy one. Feels as though it adds some edge. Does this sweater pill as horribly as the reviews state? Love it! Gray and black paired always looks fantastic! Love simple and neutral outfits like this! I love this outfit! Looks so cozy! http://bit.ly/2dkPLGO .. 10 ways to wear a blanket scarf!! Such a classic color combo! I can never get tired of it! Such a cool look..you look great!!! You look so fierce!! Loving this chic look. I love this take on classic color. This casual style is so chic. I love an all black look like this one! So cute! Such a comfy look, Rach! You can never go wrong with black and white! Looking like a star in this minimalistic and comfy, perfect for Fall outfit! The sweater looks so cozy! You look great! I love layering too. This has to be my favorite season! The perfect casual Fall outfit! 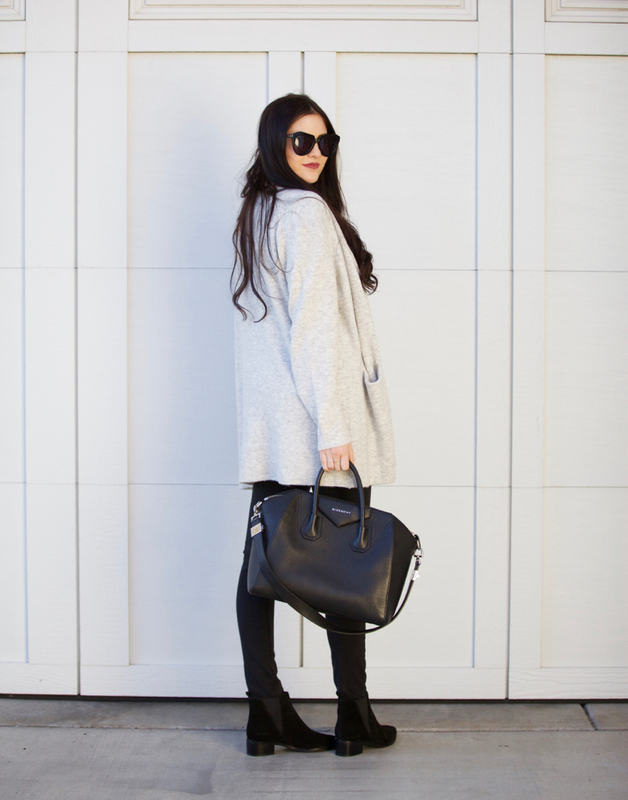 Super cozy and chic look! Beautiful! I really love the gold accent on the boots! Such a gorgeous fall look! I definitely need to try that chili recipe, it looked delicious! Love this outfit! So simple and perfect for fall! This is the absolute perfect fall look. Cozy, plush, simple, yet significant. I love those boots! I love black and grey together, too, and this cardigan looks super cozy, I’ve seen you in a few other colors, I’m thinking about picking some up myself! you look so good for having a baby this month! this outfit is great, it looks so effortlessly put together. Yup autumn is here and layers is the key. After reading this post, I have to start to buy cardigan! I’m obsessed with this look! I need it in my life! I really love your sweater! Beautiful! Super cute fall look! Love the sweater it looks so comfy!! Love this look and the bag is great!